Today I got an email from Tom Perez (please, scroll down for the letter). He asked me to send him some money to help you to win the election. First, I want to congratulate you on your spectacular result, indeed! And second, instead of money, I am sending to you a more valuable gift – a protocol toward your victory (each slogan needs an unambiguous and memorable pictorial representation). Your priorities are perfect. But some people need more than that. They need clear statements which make sense to them – slogans. 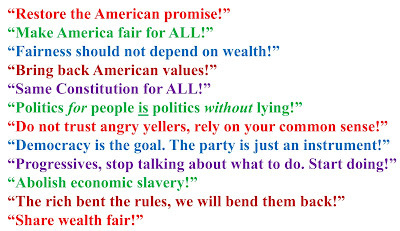 Using these slogans, you will win the seat. N.B. It is exactly what you are trying to do, so no need to pretend. But more importantly, that is exactly what America has lost over the last two decades. Gradually, slowly, little by little, it has become harder and harder for regular folks to maintain a decent life for their families. This goes to whites and none-whites, rural and urban folks. “Republicans are pouring tar of lies on me and all free thinkers! Don’t let that tar stick to you”. 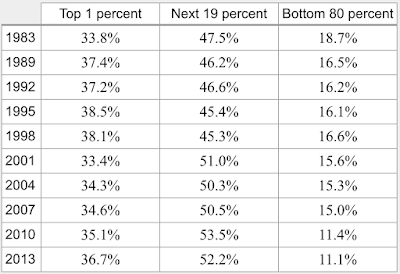 “Ten percent of Americans own three quarters of total American wealth! They force ninety percent of Americans to struggle for one quarter of what those folks make. 13 % off all American households are in debt! Imagine, you and 99 others together run a business. At the end of the year your business generated $1000,000 in profit. Out of 100 people who worked together, 10 people take $75,000 each, you and 76 more people take about $3300 each (which is about twenty-five times less! ), and 13 people get nothing. This how America works today. “1 % of American population controls one third of the total American wealth! How did it happen? “Our goal is the new optimization of wealth allocation! Sound fancy, but describes a simple idea: working folks need to take back their fair share of what they produce. For thousands of years some people have been producing wealth, and other people have been deciding who gets what. Ancient Egypt - slaves and a pharaoh; middle centuries France – peasants and a king. American Constitution established that all people have equal rights for a fair share of the wealth. But the Constitution does not write the rules. People write the rules. And over the last two decades those rules have been greatly beneficial for a few and depressive for the rest. During the last ten years, the U.S. Federal Reserve added to the market about “$4.5 trillion worth of assets“ (https://www.nytimes.com/2014/10/30/upshot/the-fed-has-not-stopped-trying-to-stimulate-the-economy.html?rref=upshot&abt=0002&abg=1)! They called it “quantitative easing”, but essentially, it was just printing money and giving it away. 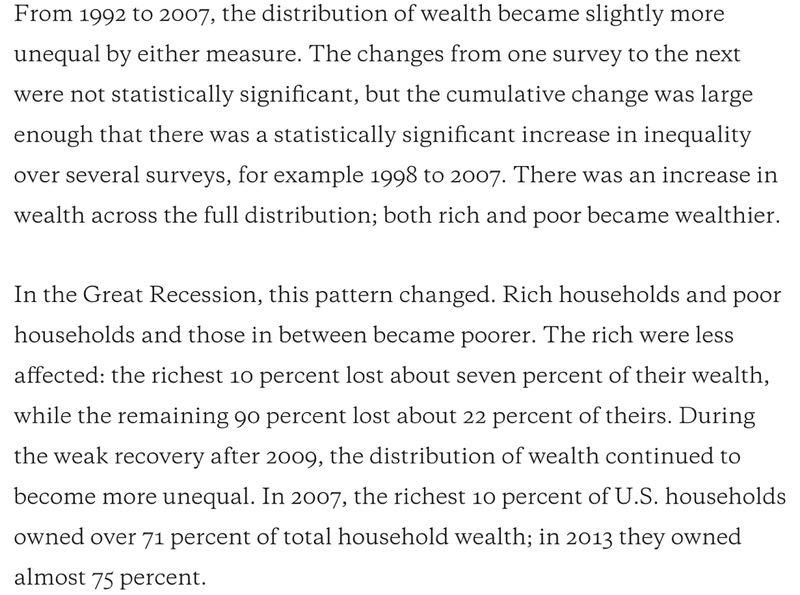 If the average wage of 90 % of Americans has not changed, where did those $4.5 trillion go? N.B. a must-read book on the matter for everyone in a progressive camp is “Saving Capitalism”, by Robert B. Reich. 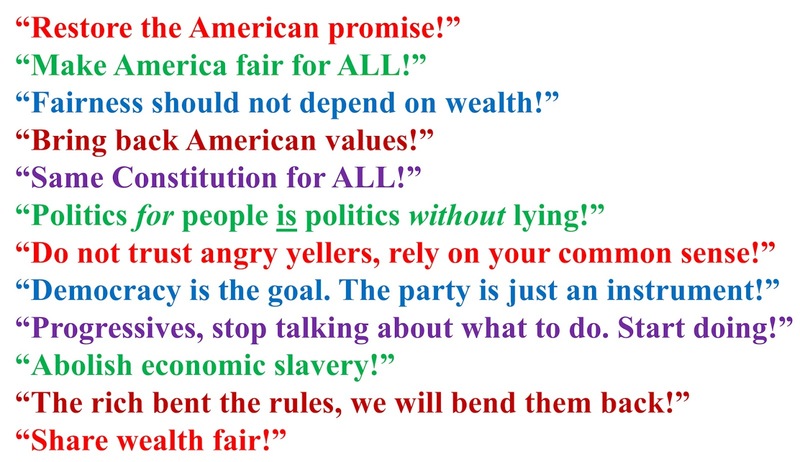 FYI: after your victory, please pass theses slogans to the next new Democrat. Mr. Ossoff, do not get sucked into “he said, she said” debates. Just tell your story! 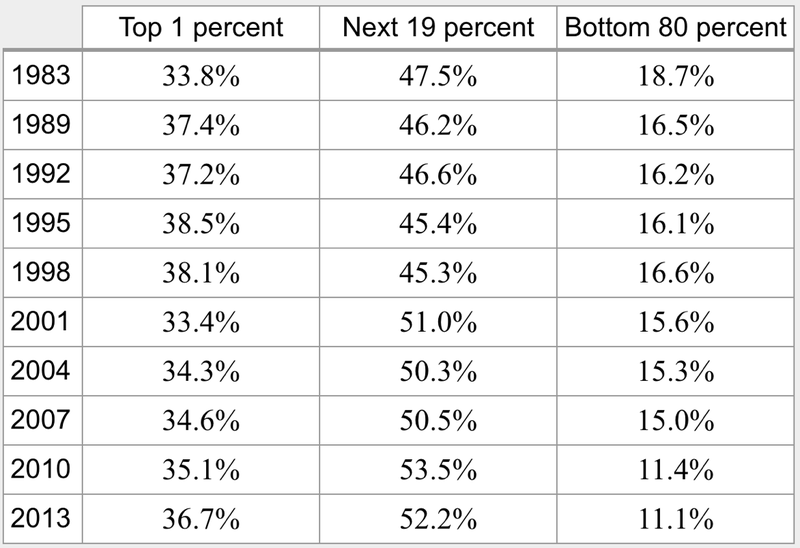 This chart shows, that since 2013 one tenth of the American population owns three quarters of total American wealth! 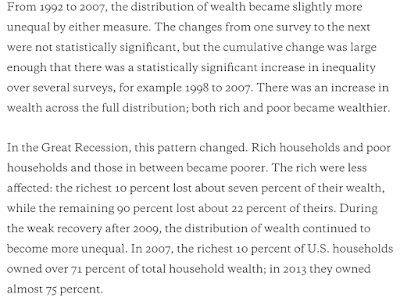 They make ninety percent of Americans to struggle for one quarter of what they make. A letter form Tom Perez. For 38 years, Georgia's 6th congressional district has been a deep shade of red. That means that after each of the past 20 elections, a Republican has gone to Congress who wouldn't fight for affordable health care, wouldn't stand up to protect the right to vote, and wouldn't demand a fair, livable wage. On June 20th, we have the chance to change all that by sending Jon Ossoff to Congress. But to break nearly four decades of precedent, he's going to need all the help we can give him. 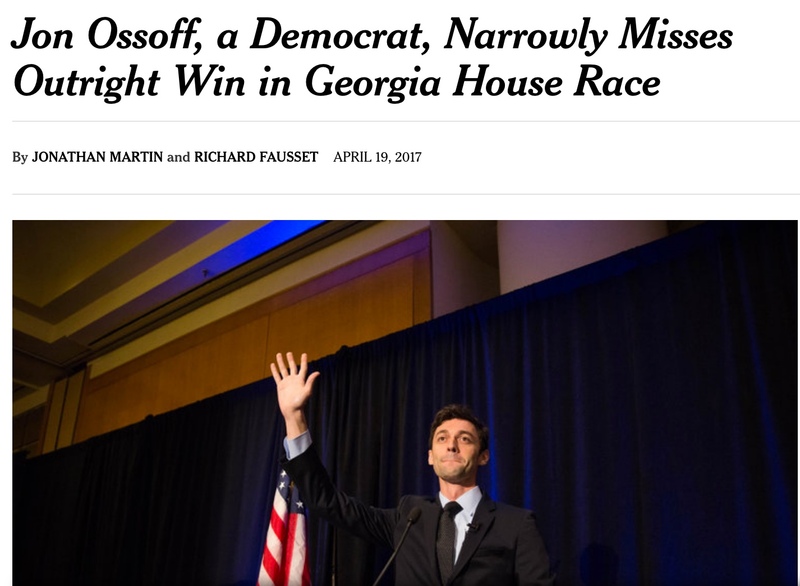 Can you split a $10 donation between Jon Ossoff and the DNC to help elect Democrats in Georgia and all across the country? I know Jon, and I know he's someone who cares about the people of Georgia's 6th district. He got into this race because he believes, in the words of his mentor John Lewis, in getting in "good trouble" to create change. In a Congress that has become paralyzed by partisan gridlock, I know Jon will be a breath of fresh air. Jon put up an impressive display in yesterday's primary, but now he needs all of us with him to win again in just 62 days. Pitch in $10 or more today to help elect Jon Ossoff and Democrats like him across the country.